Encompassing the very best of what South America has to offer – from vibrant cities, to verdant rainforests and white sandy beaches – Brazil has it all. 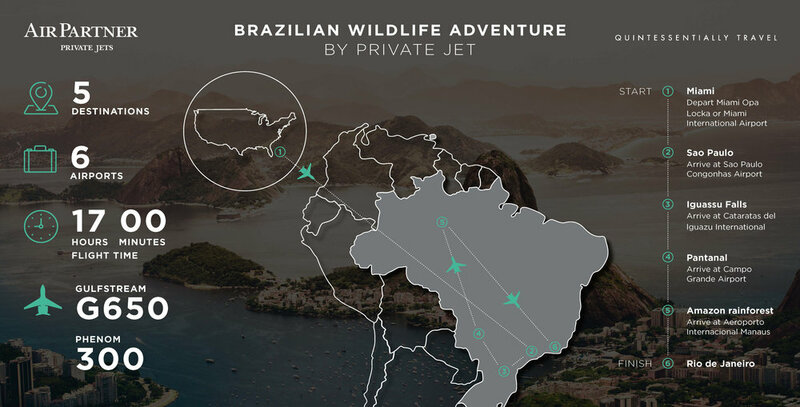 This wildlife adventure will take you from the vitality and creativity of the city of Sao Paulo to an ecological lodge with a full day of wildlife spotting, through the lush Amazonian rainforest and will culminate in 3 nights at the Art deco masterpiece of the Belmond Rio Copacabana Palace, situated on one of the world’s most iconic beaches. This experience includes a drive and guide, as well as tickets to Brazilian Falls Park, Argentinian Falls Park, Corcovado National Park and Sugarloaf Mountain. Quintessentially Travel is the award-winning division of Quintessentially, the world's leading lifestyle and concierge company. Membership is not required to book travel and guests will benefit from a personal Travel Specialist who will be on hand 24/7 to create your perfect escape.